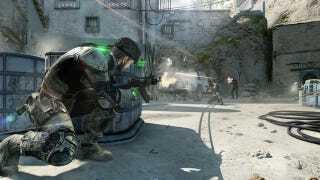 Say you've been looking forward to playing Splinter Cell: Blacklist on PC. And yet, due to an easily fixed but annoying bug, you can't get the game to start. Man! Here's what happened to me: I downloaded the game on Steam and pressed "Play," which pushed things over to Uplay, Ubisoft's own version of Steam. In Uplay, I'd press "Play" again, only to have the game immediately jump to the "Thank you for playing!" screen. There was no way to get it to start. Annoying. I've been having this happen for the better part of a week on my main gaming PC—I was using an early Steam code provided by Ubisoft, and the game just wouldn't work. I had been assuming it was an issue with authentication on pre-launch servers, but I eventually downloaded it onto my second PC, where it worked just fine—and after launch, my initial installation still wouldn't load. I turned to google, and eventually found this video from StraightGamesta, who outlines a fix. 2: Change "WindowStyleFinal=1" option to 0 or 2. I opened up the .ini file, changed the value to 2 (the option for windowed fullscreen) and the game booted perfectly. But if you are having the same game-won't-launch issue I was, I hope this is helpful.